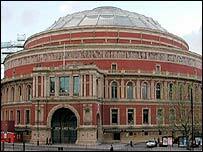 The BBC Proms are to resume after a fire at the Royal Albert Hall forced a concert cancellation at the weekend. Part of the west London building was filled with smoke and the electricity was cut off, leaving the Philadelphia Orchestra unable to play on Sunday. They will return on Monday to perform the fifth symphonies of Beethoven and Tchaikovsky, conducted by German-born Christoph Eschenbach. Tickets will be refunded for Sunday's event, which will not be rearranged. Those who bought tickets from the Royal Albert Hall by telephone or online need take no action, the BBC said, as they will receive their money back this week. Anyone purchasing tickets with cash from the box office has been advised to post them back to the venue. A Late Night Prom will also go ahead as planned.